We present a fluid–solid-growth model for the evolution of a saccular cerebral aneurysm on the internal carotid sinus artery. The model utilises a realistic constitutive model of the arterial wall that accounts for the structural arrangement of collagen fibres in the medial and adventitial layers, the natural reference configurations in which the collagen fibres are recruited to load bearing and the mass of the elastin and collagenous constituents. The structural model is integrated into a patient-specific geometry of the internal carotid artery. 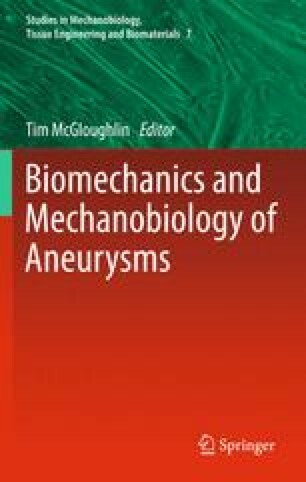 This enables growth and remodelling (G&R) of the aneurysmal section to be explicitly linked to physiologically realistic haemodynamic stimuli. In addition, a quasi-static approach is used to obtain the geometry of the aneurysmal section at systolic and diastolic pressures, enabling G&R to be explicitly linked to the magnitude of the cyclic stretches. To our knowledge, this is the first patient-specific model of cerebral aneurysm evolution that incorporates a realistic constitutive model of the arterial wall and explicitly links G&R to the pulsatile mechanical environment. It will provide the basis for further investigating and elucidating the aetiology of the disease. Financial support for this research was partly provided by @neurIST, an Integrated EU Project (Call Identifier FP6-2004-IST-4) and The Centre of Excellence in Personalized Healthcare (funded by the Wellcome Trust and EPSRC, grant number WT 088877/Z/09/Z). This support is gratefully acknowledged. We acknowledge the Harwell Software Library (http://www.hsl.ac.uk) for granting UK academics the free use of its FORTRAN subroutines in non-commercial applications. MA38 was employed to solve the linear system that arises in the Newton iteration, which is required to update the deformation at successive time steps.